In exactly 16 days I would have been in remission for exactly 1 year. Do you have any idea of how happy that makes me?? overjoyed!!! A whole lot can happen in a year…My 1st year was full of love and fun! I landed an awesome job, Harlow and I’s relationship is even better than ever (who thought that could happen right?) I witnessed my best friend’s proposal, I fell in love, I was able to plan out the way I want things to go from now on…. ………But you know what they say, your plan has nothing on God’s. So here I am, sitting here at my computer trying to smile, trying to find a reason to stay at work, trying to keep my mind from going crazy, it’s been on 1000 since Friday. Sooooooo here’s what’s going on. I went to my new doctor on Friday, who by they way is absolutely AMAZING!!! and he pretty much said that the lump in my chest, that I’ve been questioning since August, and that BHB said was nothing, just may be something. smh. So here we are again…almost a year to the day of my remission that I am heading back to Huntsville in 14 days in order to have a lump tested (biopsied), because the doctors here just ruled it out, because of 1 doctors decision. But until you have been in my shoes, until you have walked this walk, and until you have tasted the disgusting drugs and felt the effects that they have, you can never tell me “you will be ok”. Because while I am praying that it is nothing and that it’s a build up of necrotic tissue, I can’t help to tense up at the thought that….Here we go again, back at it! The dreams that I have been having the past few nights have been hell!! it’s like reliving the injections, the pain, the nausea, the weakness, the chills, the fatigue all in one night. So from now until i get my results back…please bare with me as I deal with my emotions and get my thought process under control. Because I’m scared of what may lie ahead. But I’m strong enough to know that if I gotta go back in for round 2, God’s got me and I’m gonna be a champ again. This month…what can I say. It’s been a lot for me. It’s been a month where I hit the 1 year mark of when I started treatment (October 9). So many feelings have come back, having to share my story to people that I don’t even know. I shared my story with an awesome group of ladies last Saturday night. It was a night of laughs, great food, information and just “girl power”. I was asked to present my story. it was the first time I had done so in a crowd, i’ve told it to my friends and some family but never a crowd of people. I was nervous, I couldn’t eat, i barely slept the night night before. right before I got up i remember my best friend Keitha saying, its ok…it’s your story, it’s not like you don’t know what your talking about. as I walked to the front i remembered that and…well…it is my story it’s everything that I went through. I tried to tell them in complete detail without breaking down and it’s crazy that during the story i could feel my stomach burn when i talked about the adriamycin “red devil”, my bones started to ache and cramp when i tried to describe taxol and the way they all made me feel. It was scary!!! but I made it through the night, and I enjoyed myself. October is known as a scary month, many people think of witches, ghosts and goblins, I think of injections, sickness, and weakness. It’s a month I learned that chemo wasn’t going to be easy, it was a time i had to get comfortable with people seeing me in a vulnerable state, where I had to learn to smile through the hardest times, and realise some days I just couldn’t smile, it’s a month where I learned that labour pain was cake compared to chemo pain, I had to learn to embrace the changes my body and skin was making and try to find the beauty through it all. It’s a month where I felt I looked like a goblin and was scared to become a ghost…October really is a scary month for me. It’s been a year…a whole year, last year this time i didn’t think i would see this day. It’s been rough but I’m here. It’s so many things happening around me, people are dying and I’m here. I hate that there is so much sadness around me but I can’t help but to smile. I wake up every morning and I see my daughter wake up, stretch and say good morning mommy….words that I LOVE and look forward to. Because it reminds me that we are both here, we both made it through the night and we both fought to get here. all it takes is perspective! It’s like a never ending carousel ride, taking you around and around. and all you want to do it say “STOP!! !” and get the hell off!! but your stuck, tied down, no where to go, and your becoming so used to the feeling it’s almost numbing you. you take it, it beats up on you, but you still take it…what else can you really do?? That’s what my life feels like right now. I never ending ride, and I can’t get off! Constant tests, constant scares, treatments and so on…I’m now in treatment for Lymphedema, so I have to see a specialist every day to have treatment, and then he has to wrap my arm all up, and i mean yes it could be worse, but WHEN WILL IT STOP!!!!!! and just by typing it could be worse…I realised it could be worse. I could still be at CCI with a port in my chest, bald like a new born baby, weak and sick…but you know what I’m not. So what is a little cast for the next 2-3 weeks? I mean no one’s gonna want to cuff the “broken arm looking chick” lol but i’m ok with that. It’s so funny how just that fast it hit me that life can be so much more worse then what we make it out to be. We could all be in a much more horrible situation…like we should be thankful for the things we do have. 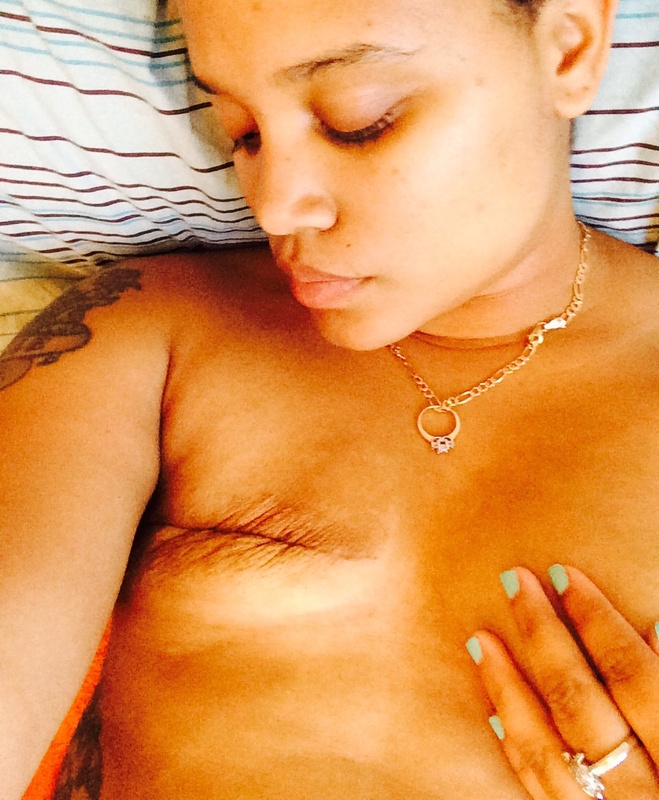 I constantly hear of women dying from breast cancer, and I’m here. The Lord gave me another day, to enjoy life and spend with my daughter. I’m still here, sometimes I feel like something is really wrong and the doctors here haven’t found it, but I’m still here and kickin. and for that I’m hella grateful! You know what…Thank God I decided to write a blog because it’s my diary, it helps me to sift through my thoughts and ideas and just let it out…some days i’m “inspirational” (so they say) and other’s i’m on here just ranting and raving…for what? most times no reason at all…but I’m human…and the people that read this blog are human too! so forgive me for the days I go off…I’m honestly still dealing with my emotions from last year. OMG I’m speaking at an event Oct 24. I AM NERVOUS!! <- you see I made that bold right? Cause I have bubble guts just thinking about getting up and speaking. at first I was praying that I would have my surgery around that time, but I’ve realised now that God has his plans for me. As one of the youngest to have fought and won against this disease, I am here for a purpose, and I need to be able to help inspire women and get them to love themselves and their body enough to fully listen to it and pay attention. I don’t want another woman especially a young woman, or mother to deal with this pain. So I am here to bring awareness and spread as much of that as I can, on this little island and anywhere else…I’m a fighter, I’m a survivor, I am pink…I am a ribbon runner! So for many, today is a day that they will never forget. For many it’s the day they witnessed the planes join in to the towers and the pentagon…and the United flight crash in PA. If I was to ask many of you where you were on Sept 11, 2001 you would know where you were and what you were doing at that time. For me? I was at school Willingboro High going into gym class when the first plane hit…and in gym when the second one hit. I remember school being let out early and many of my friends rushing home because their parents either worked in NY close or in the buildings. It was a very scary time, I remember my dad and I taking my mom back up to her ship the day after she had watched the second plane go into the building, because all military personnel was being deployed, even the USS Detroit. what a day!!! I remember 9/11 for another reason as well, last year though. Sept 11, 2014. 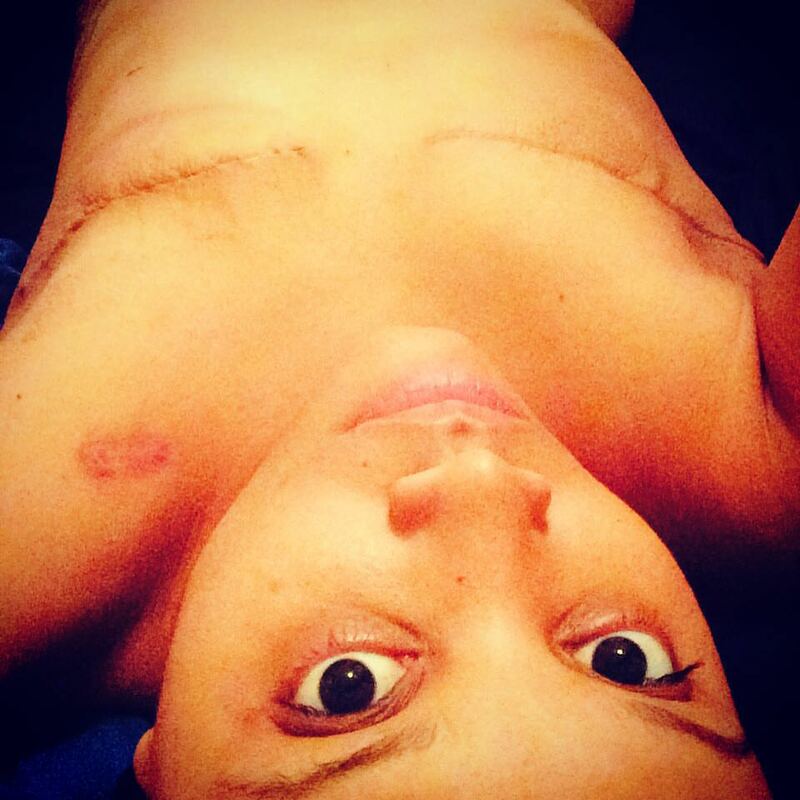 The day I had my first Mastectomy. right now it’s 7:45 am in Huntsville, AL and my appointment was for 7:30 at the breast center to have my breast injected with a dye that would light up my lymph nodes it they had cancer in them. My surgery was scheduled for 11 i believe. it was a day I was so scared, I didn’t know what was going to happen and I couldn’t stop crying. I had 2 amazing people with me though. They did everything in their power to keep my calm. The doctor from OU and 1 of the campus pastors came and anointed me and prayed over me. I needed that. after I was prepped, Dr. Randall came in and went through the procedure, told me he’s got me…I know he did, because I had already asked God to guide his hands and if you saw my scar and how neat it is, you know the good Lord had a part in that. My surgery went well…. Today 9/11, I am about to head in for a CT scan. I had an ultrasound 2 weeks ago and I was called into the office yesterday. it looks like there is something there same side, right above the scar. I’m scared!!! but I have already prayed to God to please let this be something other then a tumor….and if it is…it’s in his hands, and I will fight, again! so you may remember 9/11 for a reason or 2. I now have 3 reasons I will forever and always remember this day.